Germany Trade & Invest (GTAI) traveled to India from 4 to 8 December 2017 together with business representatives from the new federal states to promote the business location of eastern Germany. Representatives of the region Berlin-Brandenburg and Saxony as well as representatives of the East German top clusters Silicon Saxony and Cluster IT Central Germany are among the participants. The first stop of the week-long delegation trip was on December 4, the West Indian metropolis Mumbai. Here, potential Indian investors should be presented with the locational advantages of Eastern Germany and, in particular, the latest developments in the ICT sector presented. The presentations were supplemented by short presentations by Indian company representatives, who have already successfully invested in Germany. 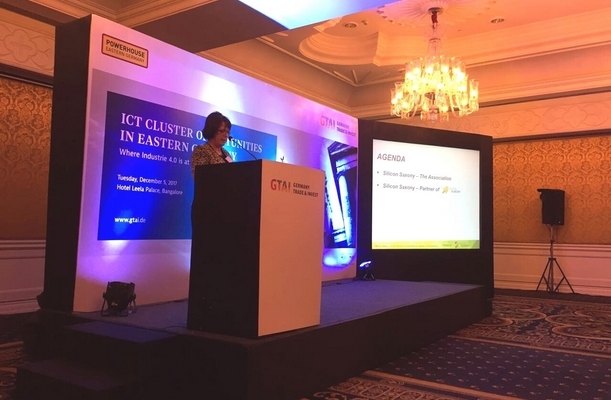 From 5 to 8 December 2017, the trip to Bangalore and Delhi, where the East German ICT industry presented their respective clusters, continued. Investor events took place at both locations on the subject of "ICT Cluster Opportunities in Eastern Germany". In doing so, the focus was on the efficiency and innovative power of the ICT location Germany and especially the new federal states. In addition, cooperation exchanges took place where East German and Indian participants had the chance to exchange views on possibilities for cooperation. The framework program also included a briefing on India's economic and political environment and visits to companies and associations. Cluster marketing is intended not only to strengthen cooperation between East German and Indian clusters and networks, but also to interest Indian companies in settling in the new federal states. Germany Trade & Invest (GTAI) is the economic development agency of the Federal Republic of Germany. The company informs German companies about foreign markets, promotes Germany as an economic and technological location and assists foreign companies in settling in Germany. Gitta Haupold, Managing Director and Member of the Executive Board of Silicon Saxony e. V., presents the Saxon high-tech network in India.